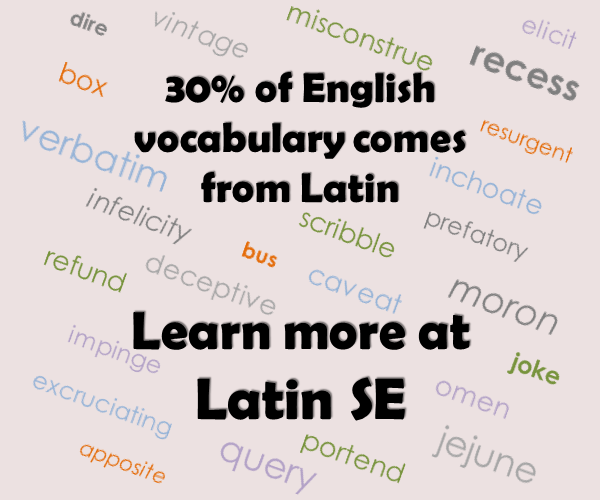 In What can we do to advertise Latin.SE?, I mentioned the possibility of creating community promotion ads for other sites. An ad for our site is currently one of several ads in the rotation on Christianity.SE, and is generating an average of about 4 visits/day. Sites can only accept community promotion ads if they have graduated, so sites like French, Spanish, and Linguistics are unfortunately not possibilities. 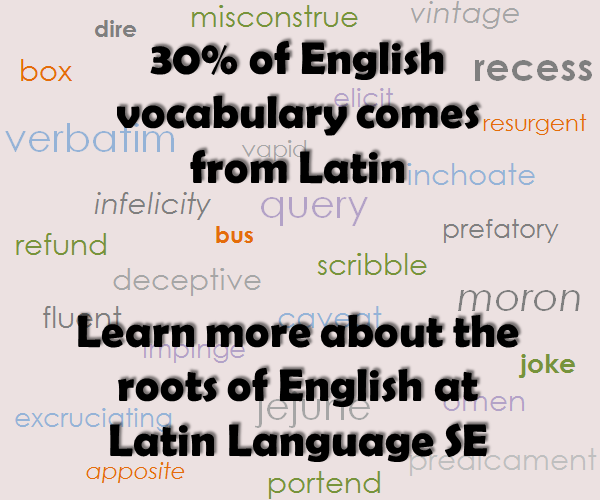 However, English Language & Usage.SE is a good option – many of its users have an academic interest in English and etymology, and it gets nearly 20 times the traffic of Christianity.SE. So, who has an idea for an ad? It ought to appeal to English language experts and enthusiasts, especially those who might also have an interest in Latin. Here are the technical instructions, along with some existing examples. Two key parameters are 300x250 or 600x500 pixels and either a colored background or a border. This ad is posted on ELU's meta, and has started generating hits for us. Here's an ad possibility I've created. All the words in the background come directly from Latin – no Romance intermediaries. Of course, the 30% number is more general. Feedback is welcome! To be really honest, the quality of the questions and answers on the Latin site is immensely superior to that of those on the English site. Are we sure that we want to invite the sort of questions that are debated there? Also, rather than attracting the narrow-minded Christians who populate the "Christianity" site I think we ought to lure the better class of users who populate the "Biblical hermeneutics" site. What can we do to advertise Latin.SE? Should all-Latin questions be permitted? Could this question on Latin's transformation into Romance languages be narrowed and made in-scope? Should our tags be in Latin?